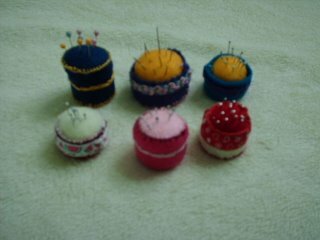 These pincushions are made from soda bottle caps, felt and craft thread. Very easy and fun to make. Sorry about the blurry picture, though. It was cloudy that day. Inspired from a Flickr pincushion group member, verybigjen. Check out my flicker photos for more crafty things I made and thrift finds over the weekend and past few weeks. whoa! Those are amzing! I think they are so adorable-so how did you do it? REally, I love the folksiness of them-so rad! these are really cute!!!!! just saw a pattern similar (but it was flowers... they looked just like yours but with felt petals and leaves...) saw it in a retro magazine!!! too ironic!